This is a sad sad day for the Empire and Scum and a GREAT day for us Rebel players (kinda). 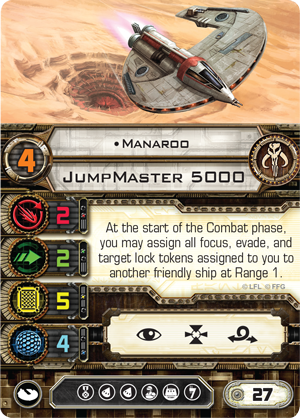 (1) Manaroo - say goodbye to the old days of flying away from the battle and triggering her pilot ability from the other side of the table (not exactly but you get the ghist). Welcome to the new and not so improved Manaroo. That is correct folks, her pilot ability now only triggers at Range 1. Talk about filthy, this one hurts the Dengaroo and Parattani builds in particular but it will force players to be considerably more aggressive with Manaroo. 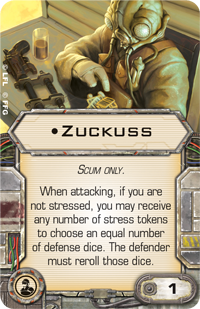 (2) Zuckess - your ship must currently be "stress free" in order for Zuckess to trigger. I understand this change given how well Dengaroo has performed over the past year (recent world winner and such) but this will really decrease the viability of Dengaroo given that you must now clear the stress before using Zuckess again. Due to this, I think we could see a rise in Inspiring Recruit on Manroo in order to allow Dengar to clear up to two stress per round, but only time will tell. 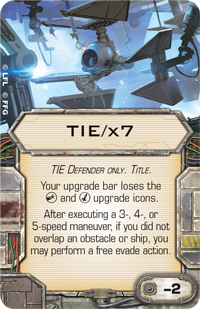 (3) TIE/x7 Title - after performing a 3,4, or 5-speed maneuver, if you DID NOT overlap an obstacle or ship, you may perform a free evade action. This one hurts. I can recall many times where after I performed a 3-speed maneuver and ended up getting bumped (or on a rock) but saving my defender with the "assigned" evade token. Alas, be still my heart! This has been reduced to a measly "free" evade action. As such, stress builds should put the defenders with this title in a bit of a bind now. (4) Emperor Palpatine - has gone the way of the Dodo...er...I mean C-3PO...kinda. You now are forced to name a specified die result roll once per round when rolling a friendly dice, and then after rolling you may change 1 dice result to the named result. This new ruling requires the player to choose wisely when to trigger Palpatine as you cannot roll dice and then decide if you want to trigger Palpatine. It must be stated before you roll your dice. 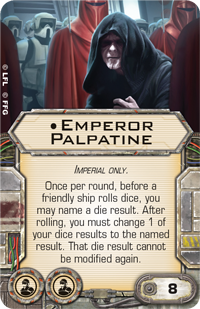 In addition, if you roll Palpatine for defense and say "evade" and roll all "evades" then you would simply end up with the rolled results. You must be able to change a rolled result to the result that you spat out of your mouth prior to the dice roll. "If a ship with this card assigned to it suffers critical damage during an attack, it must suffer the Damage card assigned to I'll Show You the Dark Side instead (even if it has shield tokens)"
Well folks this should shake up the meta a bit in my opinion but eh we shall see! Stay tuned for more updates as we digest the recent FAQ update.